Area: 4,033 sq. km. (1,557 sq. mi. ), slightly larger than Rhode Island. Cities: Capital: Praia (pop. 200,000 est.). Other city — Mindelo (pop. 67,844 est.). Terrain: Steep, rugged, rocky, volcanic. Climate: Temperate; warm, dry summer; precipitation meager and erratic. Nationality: Noun and adjective — Cape Verdean(s). Annual population growth rate (2008 est. ): 1.5%. Ethnic groups: Creole (mixed African and Portuguese) 71%, African 28%, European 1%. Languages: Portuguese (official); Cape Verdean Creole (national). Health: Infant mortality rate (2009): 23/1,000. Life expectancy (2009) — 71 years. Constitution: 1980; revised 1992, 1995, 1999, 2009, and 2010. Branches: Executive: president (head of state), prime minister (head of government), Council of Ministers. Legislative — National Assembly. Judicial — Supreme Court, lower courts. Administrative subdivisions: 17 administrative districts. Political parties: African Party for Independence of Cape Verde or PAICV [Jose Maria Pereira NEVES, chairman]; Democratic and Independent Cape Verdean Union or UCID [Antonio MONTEIRO]; Movement for Democracy or MPD [Carlos VEIGA]. GDP per capita (2010): $3,157. Real GDP growth rate (2011): 5.6%. Natural resources: Salt, pozzolana, limestone, fish, shellfish. Agriculture: Products: bananas, corn, beans, sugarcane, coffee, fruits, vegetables, livestock products. Industry: Types: fish and fish products, clothing, shoes, beverages, salt, construction, building materials, ship repair, furniture, metal products, tourism. Trade (2009): Exports: $36.7 million: re-exported fuel, fish and crustaceans, clothing, shoes and shoe parts. Imports — $746.3 million: consumer goods, intermediary goods, capital goods, petroleum. Major trading partners, exports — Spain 62%, Portugal 34%, France 3%, United States 1%. Major trading partners, imports — Portugal 48%, Netherlands 17%, Spain 10%, Brazil 4%, Germany 2%. 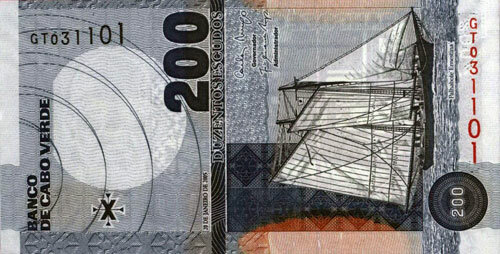 Currency: Escudo (CVEsc 86.9.6 = $1 as of January 2012), which is pegged to the Euro. Economic aid received (2005): $161 million. Major donors — Portugal ($43 million); European Union ($22 million); World Bank-IDA ($21 million); Luxembourg ($15 million); Netherlands ($10 million). U.S. economic aid (FY 2011): $66.2 million in MCC Compact; $125,000 in military education and training. 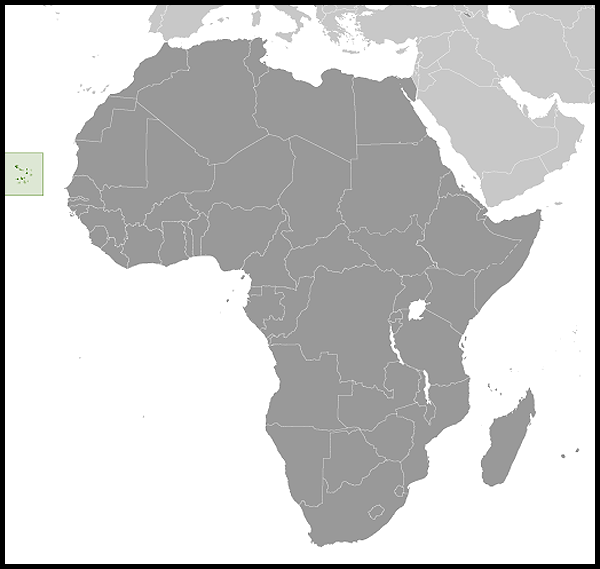 The Cape Verde Islands are located in the mid-Atlantic Ocean some 450 kilometers (about 300 mi.) off the west coast of Africa. The archipelago includes 10 islands and 5 islets, divided into the windward (Barlavento) and leeward (Sotavento) groups. 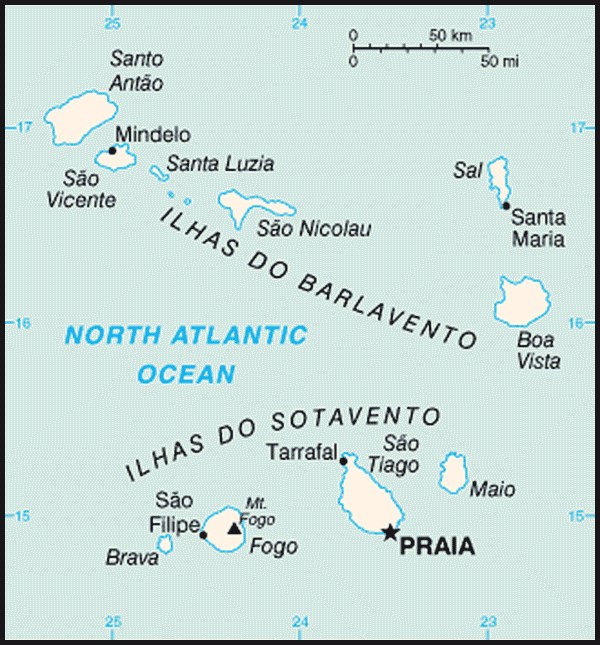 The main islands in the Barlavento group are Santo Antao, Sao Vicente, Santa Luzia, Sao Nicolau, Sal, and Boa Vista; those of the Sotavento group include Maio, Santiago, Fogo, and Brava. All islands but Santa Luzia are inhabited. Three islands — Sal, Boa Vista, and Maio — generally are level and very dry. Mountains higher than 1,280 meters (4,200 ft.) are found on Santiago, Fogo, Santo Antao, and Sao Nicolau. Sand carried by high winds has created spectacular rock formations on all islands, especially the windward ones. Sheer, jagged cliffs rise from the sea on several of the mountainous islands. Natural vegetation is sparse in the uplands and coast, but interior valleys support denser growth. Rainfall is irregular, and the archipelago suffers periodic droughts and consequent food shortages. The average precipitation per year in Praia is 24 centimeters (9.5 in.). During the winter, storms blowing from the Sahara sometimes cloud the sky, but sunny days are the norm year round. The Cape Verde archipelago was uninhabited until the Portuguese discovered the islands in 1456. Enslaved Africans were brought to the islands to work on Portuguese plantations. They were joined by entrepreneurs and refugees fleeing religious persecution in Europe, leading to a rich cultural and ethnic mix. The influence of African culture is most pronounced on the island of Santiago, where nearly half of the population resides. Sparse rain and few natural resources historically have induced Cape Verdeans to emigrate. It is believed that of the more than 1 million individuals of Cape Verdean ancestry, fewer than half actually live on the islands. Some 500,000 people of Cape Verdean ancestry live in the United States, mainly in New England. Portugal, Netherlands, Italy, France, Senegal, and Sao Tome and Principe also have large Cape Verdean communities. The official language is Portuguese, but Cape Verdeans also speak Cape Verdean Creole, which is based on archaic Portuguese and influenced by African and European languages. Cape Verde has a rich tradition of Cape Verdean Creole literature and music. Grammy Award-winning singer Cesaria Evora, the "barefoot diva" and the country's beloved celebrity, died at age 70 on December 17, 2011. In 1462, Portuguese settlers arrived at Santiago and founded Ribeira Grande (now Cidade Velha), the first permanent European settlement city in the tropics. In the 16th century, the archipelago prospered from the transatlantic slave trade. Pirates occasionally attacked the Portuguese settlements. Sir Francis Drake sacked Ribeira Grande in 1585. After a French attack in 1712, the city declined in importance relative to Praia, which became the capital in 1770. With the decline in the slave trade, Cape Verde's early prosperity slowly vanished. However, the islands' position astride mid-Atlantic shipping lanes made Cape Verde an ideal location for re-supplying ships. Because of its excellent harbor, Mindelo (on the island of Sao Vicente) became an important commercial center during the 19th century. By 1972, the PAIGC controlled much of Portuguese Guinea despite the presence of the Portuguese troops, but the organization did not attempt to disrupt Portuguese control in Cape Verde. Portuguese Guinea declared independence in 1973 and was granted de jure independence in 1974. Following the April 1974 revolution in Portugal, the PAIGC became an active political movement in Cape Verde. In December 1974, the PAIGC and Portugal signed an agreement providing for a transitional government composed of Portuguese and Cape Verdeans. On June 30, 1975, Cape Verdeans elected a National Assembly, which received the instruments of independence from Portugal on July 5, 1975. Immediately following the November 1980 coup in Guinea-Bissau, relations between Cape Verde and Guinea-Bissau became strained. Cape Verde abandoned its hope for unity with Guinea-Bissau and formed the African Party for Independence of Cape Verde (PAICV). The PAICV and its predecessor established a one-party system and ruled Cape Verde from independence until 1990. Responding to growing pressure for pluralistic democracy, the PAICV called an emergency congress in February 1990 to discuss proposed constitutional changes to end one-party rule. Opposition groups came together to form the Movement for Democracy (MPD) in Praia in April 1990. Together, they campaigned for the right to contest the presidential election scheduled for December 1990. The one-party state was abolished September 28, 1990, and the first multi-party elections were held in January 1991. The MPD won a majority of the seats in the National Assembly, and MPD presidential candidate Mascarenhas Monteiro defeated the PAICV's candidate with 73.5% of the votes. Legislative elections in December 1995 increased the MPD majority in the National Assembly. The party won 50 of the National Assembly's 72 seats. A February 1996 presidential election returned President Mascarenhas Monteiro to office. Legislative elections in January 2001 returned power to the PAICV, with the PAICV holding 40 of the National Assembly seats, MPD 30, and Party for Democratic Convergence (PCD) and Party for Labor and Solidarity (PTS) 1 each. In February 2001, the PAICV-supported presidential candidate, Pedro Pires, defeated former MPD leader Carlos Veiga. In 2006, the PAICV won legislative elections again, and Pires was re-elected as President. The Cape Verde constitution — adopted in 1980 and revised in 1992, 1995, and 1999, 2009, and 2010 — forms the basis of government. The president is head of state and is elected by popular vote for a 5-year term. The prime minister is head of government and proposes other ministers and secretaries of state. The prime minister is nominated by the National Assembly and appointed by the president. Members of the National Assembly are elected by popular vote for 5-year terms. Cape Verde enjoys a stable democratic system. The MPD captured a governing majority in the National Assembly in the country's first multi-party general elections in 1991, and the PAICV regained power in the 2001 legislative elections. Cape Verde held parliamentary elections in February 2011, which the Independent National Electoral Commission (NEC) judged free and fair. Three parties now hold seats in the National Assembly — PAICV 39, MPD 31, and the Democratic and Independent Cape Verdean Union (UCID) 2. A first round of presidential elections was held on August 7, 2011. The top two contenders, Jorge Carlos Fonseca of MPD and Manuel Inocencio Sousa of PAICV, received 37.4% and 32.8% of the vote, respectively. Fonseca won 54% of the vote in the August 21 runoff election and took office as President on September 9, 2011. In November 2011, former President Pires won the Mo Ibrahim Foundation's 2011 prize in good governance for "transforming Cape Verde into a model of democracy, stability, and increased prosperity." The judicial system is comprised of a Supreme Court of Justice — whose members are appointed by the president, the National Assembly, and the Board of the Judiciary — and regional courts. Separate courts hear civil, constitutional, and criminal cases. Appeal is to the Supreme Court. Cape Verde has few natural resources and suffers from poor rainfall and limited fresh water. Only 4 of the 10 main islands (Santiago, Santo Antao, Fogo, and Brava) normally support significant agricultural production, and over 90% of all food consumed in Cape Verde is imported. Mineral resources include salt, pozzolana (a volcanic rock used in cement production), and limestone. The economy of Cape Verde is service-oriented, with commerce, transport, and public services accounting for more than 70% of GDP. Although nearly 70% of the population lives in rural areas, agriculture and fishing contribute only about 9% of GDP. Light manufacturing accounts for most of the remainder. An amount estimated at about 20% of GDP is contributed to the domestic economy through remittances from expatriate Cape Verdeans. Since 1991, the government has pursued market-oriented economic policies, including an open welcome to foreign investors and a far-reaching privatization program. It established as top development priorities the promotion of market economy and of the private sector; the development of tourism, light manufacturing industries, and fisheries; and the development of transport, communications, and energy facilities. From 1994 to 2000 there was a total of about $407 million in foreign investments made or planned, of which 58% were in tourism, 17% in industry, 4% in infrastructure, and 21% in fisheries and services. Cape Verde's strategic location at the crossroads of mid-Atlantic air and sea lanes has been enhanced by significant improvements at Mindelo's harbor (Porto Grande) and Praia's harbor, and at Sal's and Praia's international airports. New international airports were opened in Boa Vista (December 2007) and Sao Vicente (December 2009). Mindelo has hosted ship repair facilities since 1983. The major ports are Mindelo and Praia, but all other islands have smaller port facilities. In addition to the international airport on Sal, airports have been built on all of the inhabited islands, although the airports on Brava and Santo Antao are now closed. All other airports enjoy scheduled air service. The archipelago has 3,050 kilometers (1,830 mi.) of roads, of which 1,010 kilometers (606 mi.) are paved, most using cobblestone. Cape Verde has become a global leader in renewable energy. The government has launched an ambitious plan to reduce the country's dependence on imported fossil fuels through increased energy production from renewable resources. Through private-sector investment and government-supported projects, Cape Verde intends to generate at least 50% of electricity from renewable sources by the year 2020. Wind farms built on four of the islands now provide 10%-20% of the country's electricity. A 32-acre solar farm outside Praia is Africa's largest such facility, producing five megawatts of power. Future prospects depend heavily on the maintenance of aid flows, the encouragement of tourism, remittances, outsourcing labor to neighboring African countries, and the momentum of the government's development program. On November 22, 2010, the International Monetary Fund (IMF) approved a 15-month Policy Support Instrument (PSI) to consolidate macroeconomic stability, maintain fiscal discipline, and achieve sustained growth for Cape Verde. The PSI is designed for countries that may not need IMF financial assistance, but still seek IMF advice, monitoring, and endorsement of their policy frameworks based on country-owned poverty reduction strategies adopted in a participatory process involving civil society and development partners. Cape Verde pursues a nonaligned foreign policy and seeks cooperative relations with all states. Angola, Brazil, China, Cuba, France, Portugal, Russia, Senegal, Spain, and the United States maintain embassies in Praia. Several others, mostly European countries, maintain honorary consulates. In addition, Cape Verde maintains multilateral relations with other Lusophone nations and holds membership in many international organizations. On July 23, 2008, Cape Verde became the 153rd member of the World Trade Organization (WTO), in hopes of opening its markets for imported goods and services. The cordial relations between the United States and Cape Verde have strong historical roots. In the early 18th century, U.S. whaling ships appear to have begun recruiting crews from Brava and Fogo to hunt whales that were abundant in the waters surrounding Cape Verde. Ties between the American colonies and Cape Verde are documented as early as the 1740s, when American ships routinely anchored in Cape Verdean ports to trade for salt or buy slaves. The tradition of emigration to the United States began at that time and continues today. The first U.S. consulate in sub-Saharan Africa was established in Cape Verde in 1818. U.S. consular representation continued throughout the 19th century. The United States recognized Cape Verde on its independence day and supported its admission to the United Nations. Cape Verde assigned one of its first ambassadors to the United States, and a resident U.S. Ambassador was posted to Cape Verde in 1983. Some 4,000 American citizens reside on the islands, especially on Fogo and Brava. Prime Minister Neves visited Cape Verdean communities in New England during an official trip to the United States in 2002 and visited the U.S. again in September 2007. In August 2009, Secretary of State Hillary Clinton visited Sal Island in Cape Verde and met Prime Minister Neves. President Pires visited the United States in 2011. As evidence of its willingness to cooperate with American law enforcement officials and fight drug trafficking, Cape Verdean authorities on October 8, 2011, seized 1.5 tons of cocaine with assistance from the U.S. Drug Enforcement Administration, and are making ongoing arrests in "Operation Speedboat" — an investigation that encompassed South America, West Africa, and Europe. The United States provided emergency humanitarian aid and economic assistance to Cape Verde in the period immediately following Cape Verde's independence, as well as after natural disasters, including a hurricane that struck the island of Brava in 1982, after a severe volcanic eruption on Fogo in 1995, after deadly flooding in Sao Nicolau in 2009, and in the wake of a dengue fever epidemic in 2009. Cape Verde also is eligible for trade benefits under the African Growth and Opportunity Act (AGOA (http://www.agoa.gov/), and has signed an Open Skies agreement to facilitate air travel safety and expansion. On October 15, 2010, Cape Verde became the first sub-Saharan African country to successfully complete a U.S. Government-funded Millennium Challenge Corporation (MCC) Compact. The 5-year assistance package was worth over $110 million and achieved all of its targets for strengthening the investment climate, reforming the financial sector, improving infrastructure, increasing agricultural productivity, and achieving key policy reforms. Cape Verde is the first nation to be found eligible for a second Compact. Tentatively scheduled for signature in mid-February 2012 at a signing ceremony in Praia, this $66.2 million Compact will feature water, sanitation, and land registration reform projects, and include a land management investment project that builds on the country's e-governance performance. In 2010, U.S. exports to Cape Verde exceeded $10 million, while imports exceeded $1.4 million; under AGOA, Cape Verde exported $145,628 of goods to the United States. The U.S. Embassy (http://praia.usembassy.gov/) in Cape Verde is at Rua Abilio Macedo, 6, Praia; C.P.201, tel. (238) 260 8900, fax 2611 355.